Many researchers have tried to improve the tribological characteristics of lubricants to decrease coefficients of friction and wear rates. Recently, nanoparticles have emerged as a new kind of additive because of their size, shape, and other properties. A nanolubricant is a new kind of engineering lubricant made by dispersing nanoparticles in a lubricant. Investigations related to the tribological characteristics of lubricants with addition of nanoparticles are reviewed herein. The paper focuses on the effects of the nanoparticle concentration on the tribological performance during oil lubrication. Specifically, measurements of physicochemical properties and tribological analysis were performed along with morphological study of the nanoparticles. The mechanisms of lubrication involving nanoparticles are discussed based on data collected from the experimental analysis and compared with work in literature. The effect of varying the concentration of alumina (Al2O3) nanoparticles in polanga oil on the coefficient of friction and wear was evaluated. The minimum coefficient of friction and wear were observed at 0.075% concentration, but increased at 0.1% concentration. A smooth surface of the pin was observed at 0.075% nanoparticle concentration in comparison with polanga-based oil. The maximum total acid number change was obtained for the 0.1% concentration. The wear scar obtained during the test was also minimum for the 0.075% concentration, and a better surface was observed for this concentration. In terms of future prospects, similar work based on nanoparticles with different shape and size could be carried out for other nonedible oils. Environmental degradation and pollution caused by petroleum products are major motivators for the search for alternative energy sources. Lubrication is a mechanism used to reduce frictional losses in engines, where mineral products are typically used as lubricants. Mineral oils are derived from crude oil by fractional distillation. Mineral oils are the most suitable for various applications related to the manufacturing and automobile industries [1, 2]. Mineral oils can act as lubricants to reduce the friction, wear, and tear of metals in contact during sliding motion between parts. Mineral oils are petroleum products and can be mixed with various additives to improve their performance based on the final application . However, they have adverse effects on the environment, especially during their disposal, which can pollute aquatic environments . There is thus a need to find alternatives to mineral oils. Nonedible vegetable oils represent an important renewable resource, being both more economical as well as environmentally friendly [5, 6]. Nonedible vegetable oils exhibit better biodegradability compared with petroleum-based mineral oils, but their technical properties lag behind those of conventional lubricants . Their oxidation stability is worse, and problems can occur at low temperatures due to their reduced pour-point and cloud-point values . However, nonedible vegetable oils also offer certain advantages, such as extended equipment life, minimum emissions to the atmosphere, enhanced lubricity, improved antiwear characteristics, and high viscosity index . Around 364 nonedible oils are available and could contribute as replacements, including jatropha, polanga, pongamia, neem, mahua, jojoba, etc. Most of these can be grown on waste land without affecting land required for cultivation . Around 364 types of nonedible seed oils are suitable for substitution of lubricants in two forms, i.e., blended and pure form. A vast forest area is available in India for growing nonedible plants such as ratanjyot (Jatropha curcus), karanja (Pongamia pinnata), polanga (Calophyllum inophyllum), neem (Azadirachta indica), kusum (Schleichera oleosa), mahua (Madhuca indica), etc., which are easily available and convenient for production of biolubricants . Among the available nonedible vegetable sources, one of the alternatives is Calophyllum inophyllum, commonly known as polanga. This nonedible oilseed ornamental evergreen tree belongs to the family Leguminaceae and has multiple application benefits. It flourishes best in deep soil or on exposed sea sand, requiring rainfall of around 750–5000 mm. This plant is found across the world, including India, Australia, the lowlands of the Philippines, Indonesia, and the USA. The size of the seeds is 10–20 mm, and the production depends on the geographical location. In India, 200 million tonnes of oil are produced from polanga, having a high percentage of unsaturated fatty acids. The oil yield is around 28–34% on average when using 1 kg of polanga seeds. After planting, the fifth year results in further production of polanga seeds, because seed production capacity starts in the third year but is deficient in the fourth year [11, 12, 13]. Based on the utilization of polanga-based biolubricants, polanga oil was utilized as a biolubricant to check its friction and wear characteristics at different loads and sliding distances . Among the blends, 15% addition to base mineral oil resulted in an improvement in the friction and wear performance under all applied conditions. Tetramethyl polanga (TMP) ester was produced from polanga oil, showing good lubricity properties such as higher density, higher viscosity at both 40 °C and 100 °C, and higher viscosity index (VI). Experiments were conducted during 3600 s at constant load of 40 kg and constant sliding speed of 1200 rpm at temperatures of 50, 60, 70, 80, 90, and 100 °C for all three types of lubricant. The results showed that TMP ester had the lowest coefficient of friction (COF) as well as lower energy consumption at all the tested temperatures, but the average roughness of the worn surface (Ra) and wear scar diameter were higher compared with paraffin mineral oil or commercial lubricant . Only a few studies have been performed on polanga-based biolubricants, as cited above. 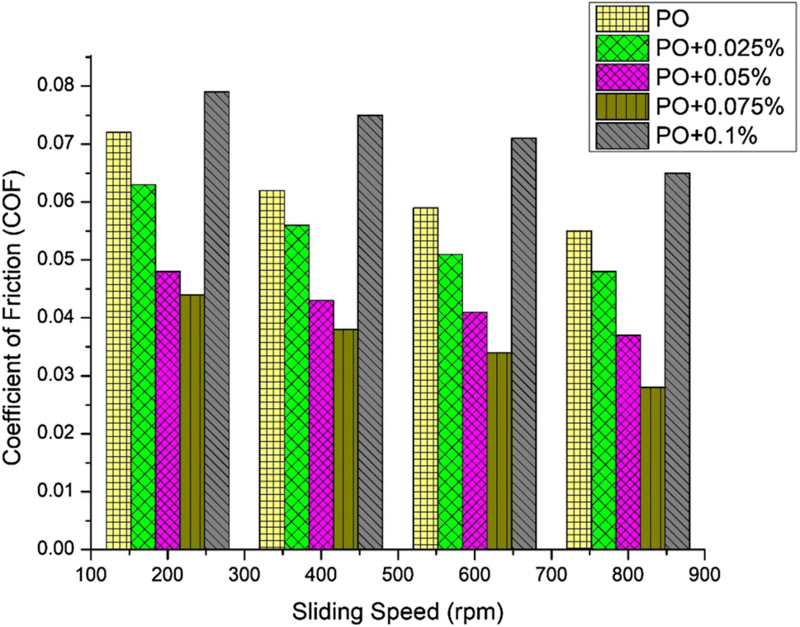 These studies investigated the effects of the sliding speed or load during use, but none of them considered addition of nanoparticles to improve their properties. For further improvement of the physicochemical properties, nanoparticles are one of the suitable additives [16, 17, 18, 19]. Various studies have been conducted to study the effect of nanoparticles on the tribological characteristics of nonedible oils, but most of them are restricted to synthetic or mineral oils, and none of them investigated this effect when using polanga as the base lubricant. Hybrid nanolubricants have been developed with different volumetric concentrations (0.25, 0.75, and 1.25 vol%). Tribology and wettability testing confirmed that the wear and coefficient of friction decrease with increasing nanoparticle concentration. Hybrid nanofluid showed the lowest pin wear and coefficient of friction. The performance of hybrid nanolubricants has also been compared with alumina nanofluid. The results showed that mixing graphene nanoparticles with alumina enhanced its tribological properties . 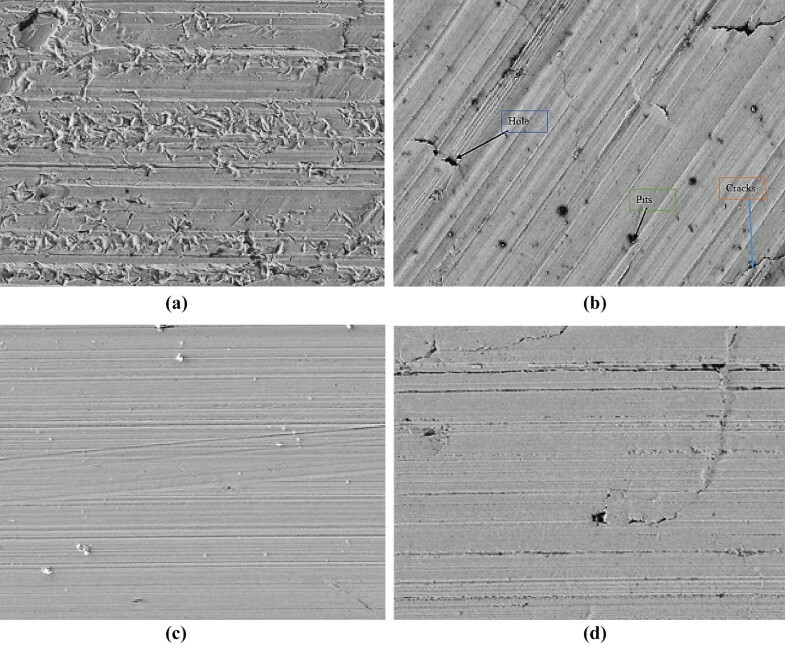 The effects of the nanoparticle volume fraction on the microstructural features and mechanical properties of polymethyl methacrylate (PMMA) were also studied. Experiments using a frustum pin tool at an appropriate processing condition, i.e., rotational speed of 1600 rpm/min and transverse velocity of 120 mm/min, showed that defect-free nanocomposites at microscale with a fine distribution of nanoparticles could be successfully prepared. 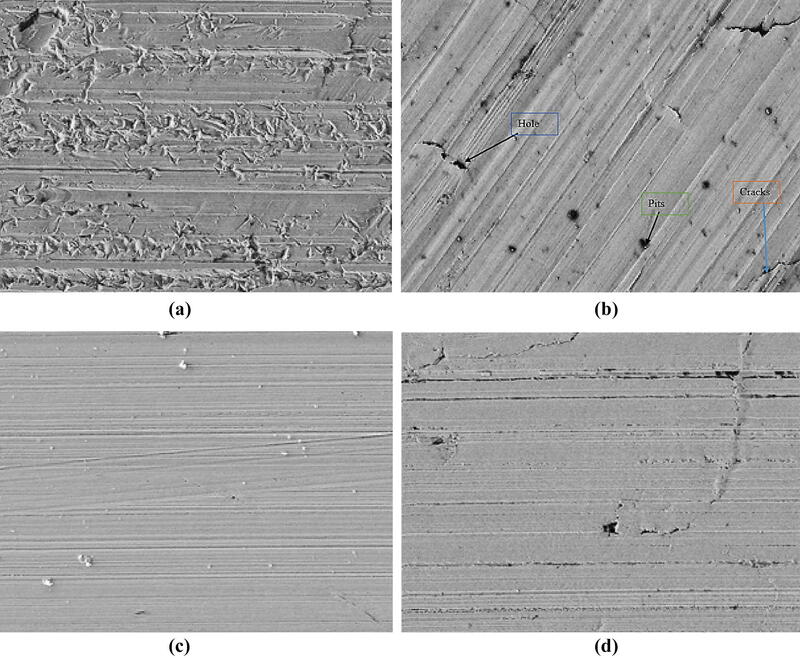 Mechanical evaluations including tensile, flexural, hardness, and impact testing indicated that the strength and toughness of the material gradually increased with the nanoparticle concentration, reaching flexural strength of 129 MPa, hardness of 101 Shore D, and impact energy of 2 kJ/m2 for the nanocomposite containing 20 vol% alumina [21, 22, 23]. These values are about 10% and 20% better than those of untreated and friction stir processing (FSP)-treated PMMA (without alumina addition). Fractographic studies indicated typical brittle features with crack deflection around the nanoparticles. More interestingly, the sliding wear rate in a pin-on-disk configuration and the coefficient of friction were reduced by up to 50% by addition of alumina nanoparticles. The worn surfaces exhibited typical sliding and ploughing features . Use of alumina nanoparticles is suitable for reducing friction and wear. Polanga oil is suitable for use as a biolubricant due to its unsaturated fatty acid composition. Application of alumina nanoparticles has not yet been mentioned, and their application as an additive is significant to improve the properties of biolubricants. Based on previous studies, Al2O3 nanoparticles also have considerable importance as they are suitable for reducing friction and wear of materials due to the repair mechanism, or have the capacity to form a sustainable protective film . 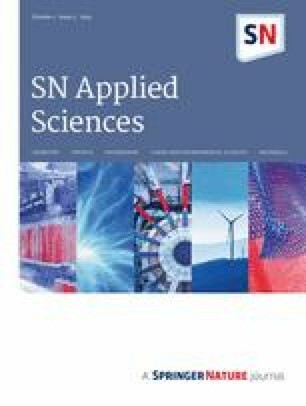 According to the literature survey above, very few studies have looked at the effect of Al2O3 nanoparticles, and no research has been conducted on their application to improve the friction and wear characteristics of lubricants, despite their significant influence on the corresponding mechanisms. Based on the literature survey above, addition of Al2O3 nanoparticles is suitable to improve the lubrication characteristics of bare polanga seed oil. The aim of the work presented herein is thus to investigate the tribological characteristics of polanga oil with nanoparticles as an additive, and also to determine the feasibility of such materials as an alternative to bare polanga oil for application at different sliding speeds. Polanga oil contains a large amount of fatty acids, which are appropriate for reduction of friction and wear for metals in sliding contact. The amount of unsaturated fatty acids is also important, as they can form a suitable protective layer within a short span of time and also include palmitic and stearic acids, which make a major contribution to the formation of the protective layer. Details regarding the content of fatty acids can be obtained from previous literature studies [11, 13]. The size of the nanoparticles considered during this study was 25 nm, due to their positive contribution to reduction of friction and wear of metals in contact . Alumina nanoparticles were purchased from M/S Sigma Aldrich Ltd. Bangalore, India, and details of the size of the nanoparticles were provided by the vendor. The nanoparticles were spherical in shape, as per the details provided by the vendor. 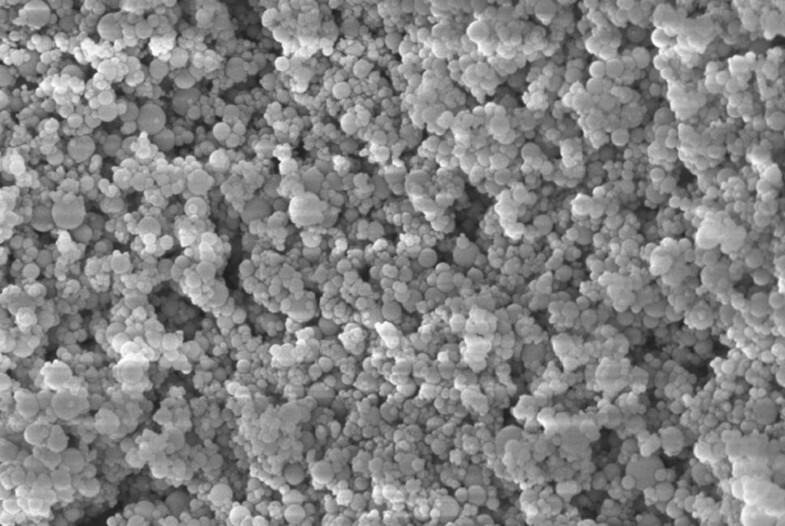 Figure 1 shows a scanning electron microscopy (SEM) image of the alumina nanoparticles. A proper dispersion of alumina nanoparticles can be achieved using different methods, among which ultrasonication is not costly and does not require much time to complete the process. To obtain a uniform and stable dispersion, nanoparticles were added to polanga oil using the ultrasonication technique. An ultrasonicator was used to mix Al2O3 nanoparticles with polanga oil. The duration of the process was 1.5 h, with nanoparticle concentrations ranging from 0.025 to 0.1% (in steps of 0.025%) added to the polanga oil. The test was performed at temperature of 65 °C. During all the tests, the temperature was kept as constant. A gap of around 8 min was left between the repetitions of the cycle, so that the process did not result in breakage of the chain structure of the nonedible oil. The polanga oil with nanoparticles added at different concentrations is designated as PO, PO + 0.025%, PO + 0.05%, PO + 0.075%, and PO + 0.1% respectively, based on the weight percentage; i.e., 0.025% indicates 2.5 g nanoparticles in 1 l of polanga oil. During the test, 500 ml of each sample was used. All samples were obtained after ultrasonication and sent to the university laboratory for further analysis of their physicochemical properties. Viscosity was evaluated using a Redwood viscometer (PEC Instruments UK) with accuracy of about ±0.1 cSt. The viscosity was measured at temperature of 40 °C and 100 °C as per ASTM standards. A Pensky–Martens closed-cup tester was utilized for flash-point and fire-point analyses. The physicochemical properties of PO, PO + 0.025%, PO + 0.05%, PO + 0.075%, and PO + 0.1% are presented in Table 1. Based on the temperature change during the test, some of the changes observed in the physicochemical properties are also stated in Table 1. A pin-on-disk device was used to perform friction and wear tests according to ASTM standards D4172 and G99 . The material of the pin used for the study was aluminum–silicon alloy, with a steel disk. The silicon was added about 7% to the aluminium as an alloying element. Cast material with cylindrical shape was purchased from a local vendor, having dimensions of about 12 cm in length and 2 mm in diameter. To obtain material with the desired length and diameter for the pin, samples obtained from the vendor were turned on a lathe in the university laboratory. Several samples were prepared for testing as per the conditions required. The hardness of the EN31 steel was 60 HRC. Details of the operating conditions used during the experiment on the pin-on-disk device are presented in Table 2. During the test, the temperature was maintained at around 125 °C using an insulator equipped with controlled heaters. This temperature was chosen based on average temperatures of lubricant in engines. A flow rate of about 5 ml/min was maintained during the experiment, calculated by flowing the oil into a measuring flask and recording the time required to fill it. The material loss from the pin was calculated as the difference in the weight of the pin before and after the experiment (Shimadzu weighing machine, accuracy around ±0.01 mg). Acetone was used to clean the pin surface in an ultrasonicator bath operated at 65 °C temperature for around 15 min. For surface analysis, an optical microscope equipped with view 7 software was used to analyze the wear scar diameter. For this analysis, each sample was washed using acetone to obtain a clear image of the sample, then the dimensions of the scar was were obtained using the scale provided in the software. To investigate the surface topography, a Nikon Eclipse optical microscope with 2000× zoom capacity was used. Conventional polanga oil was used as the reference oil for the coefficient of friction (COF) and wear behavior analysis. During the initial test to obtain reference data, only polanga oil was supplied at all the sliding speeds and constant load. After that, polanga oil with different concentrations of nanoparticles was used in the test. The experiments were repeated in triplicate with each oil to obtain the data, using the average data to plot the graphs in the results section. The coefficient of friction was obtained based on Eq. 1.
where µ is the coefficient of friction and N is the applied load. For this analysis, the friction force was obtained as a function of time during each test using the software provided with the tribometer. To obtain the COF value, Eq. 1 was applied to the average friction force and the load applied during each test. Figure 2 shows the variation of the COF with the sliding speed at constant load. The sliding speed was varied from 200 to 800 rpm in steps of 200 rpm. With increase in the sliding speed, the coefficient of friction decreased. The minimum coefficient of friction was observed at 800 rpm and the maximum at 200 rpm. With increase in the speed, the duration of content between the parts during sliding decreases, resulting in a reduction of the coefficient of friction. Addition of nanoparticles to the polanga oil had a significant effect on the results of this test. Polanga oil contains a certain amount of unsaturated fatty acids, which are suitable for maintaining a protective layer between the surfaces. The nanoparticles play a significant role in increasing their capability to form a better protective layer in coordination with the polanga nonedible oil. A tendency for stable formation was observed with addition of the nanoparticles to the polanga oil. The results obtained when adding different concentrations showed that the coefficient of friction was only successfully reduced up to 0.075%, whereas the COF increased with sliding speed thereafter. This increase in the COF occurred due to the possibility of agglomeration above a certain range. Various parameters could be considered, but the effect of concentration was one of the significant parameters, due to an improper dispersion of the nanoparticles above a certain limit. The same reason has been mentioned in previous work also. Figure 3 shows the effect of addition of alumina nanoparticles on the coefficient of friction. For this analysis, each alumina concentration was analyzed at only the highest and lowest sliding speeds, to obtain large deviations in the results. At the sliding speed of 200 rpm, the maximum coefficient of friction of around 0.0737 was observed for the 0.1% alumina nanoparticle concentration, while the minimum of around 0.0548 was obtained for the 0.075% concentration. The same trend was observed at the sliding speed of 800 rpm, although the decrease in the COF value was more pronounced in comparison with the sliding speed of 200 rpm, reaching around 12%. As the nanoparticle concentration was increased, the minimum coefficient of friction was obtained at 0.075%, whereas an increase was observed at 0.1% concentration. This effect can be attributed to deposition of nanoparticles on the surface of the pin, resulting in a strong protective film between the oil, nanoparticles, and surfaces [1, 26]. However, when the concentration of nanoparticles was increased above an optimum value, i.e., 0.075%, deep interaction of the alumina nanoparticles with the surface increased the coefficient of friction. The specific wear rate was obtained based on Eq. 2. The volumetric loss of material from the pin was calculated from the difference in weight before and after the experiment. 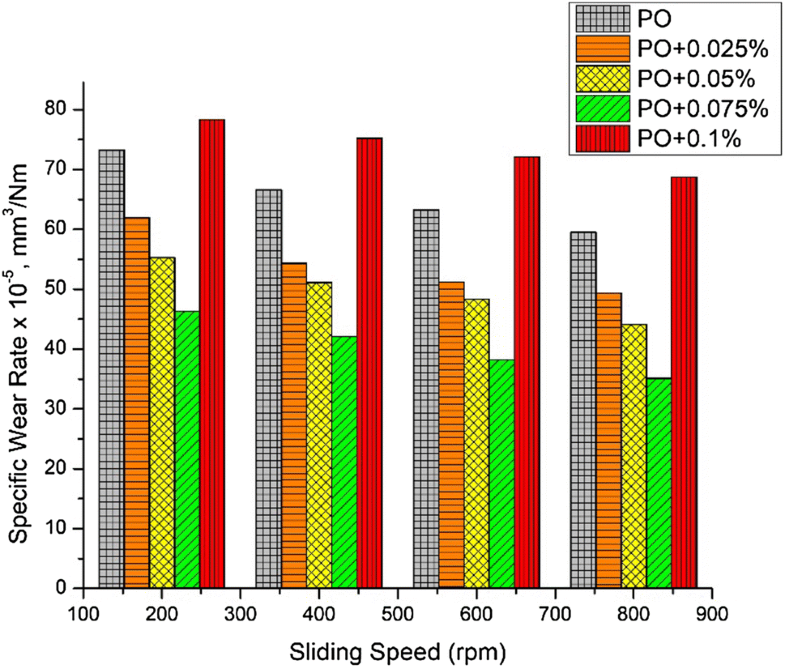 Figure 4 shows the variation of the specific wear rate with the sliding speed. With increase in the sliding speed, a decrease in the amount of wear was observed, with the maximum wear being observed at 200 rpm and the minimum at 800 rpm. The maximum wear is observed at low speed because the time available for the nanoparticles to interact with the surface is highest, resulting in more wear. The amount of wear depends on the coefficient of friction. As described in the previous section, a higher COF was obtained at the 0.1% concentration and the minimum at 0.075%, based on the combined effect of the polanga oil and nanoparticles. 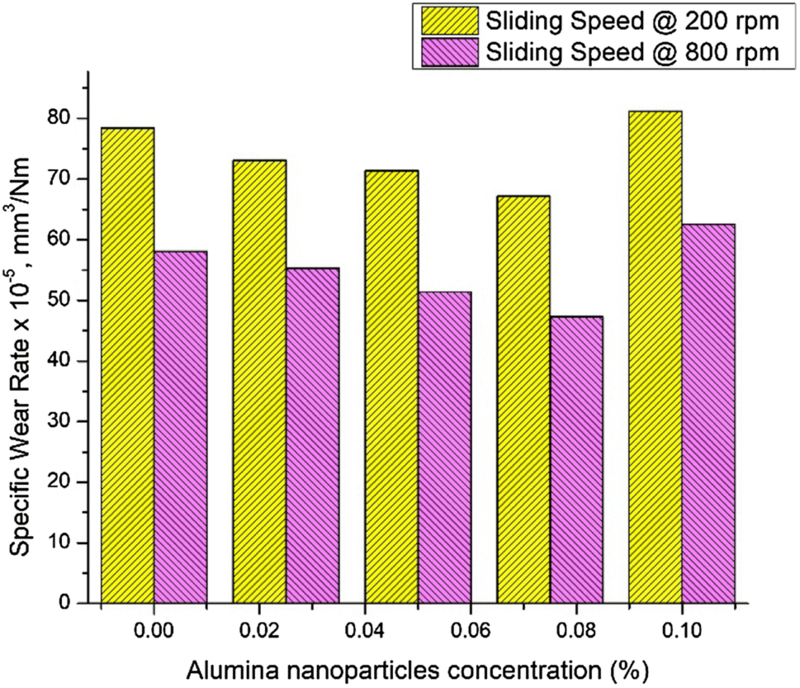 Figure 5 shows the variation of the specific wear rate with the alumina nanoparticle concentration at two sliding speeds, viz. 200 rpm and 800 rpm. The aim of choosing these sliding speeds is to observe the maximum and minimum specific wear rate values. 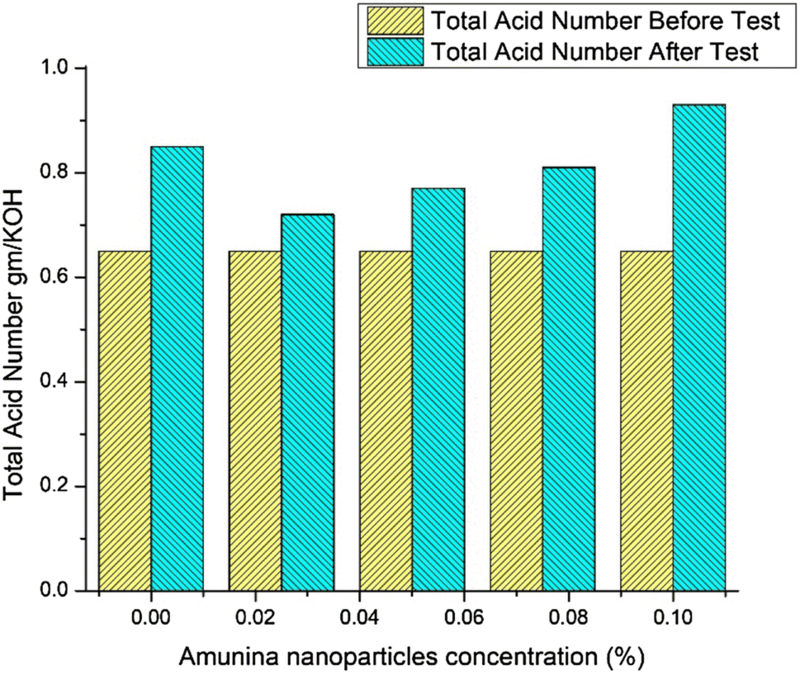 Up to alumina nanoparticle concentration of 0.075%, decreased wear in comparison with the reference oil was observed. However, the maximum amount of wear was observed for the concentration of 0.1%. A reduction of around 25% reduction was observed for the 0.075% concentration in comparison with the reference oil. This occurs due to the formation of a protective film layer between the surfaces, which is exhausted for the 0.1% concentration due to agglomeration of nanoparticles at the surface. This could result in abrasive wear, resulting in an increase of the wear value. Greater accumulation of the nanoparticles results in formation of a solid surface, which results in more wear. The same reason has also been stated in literature. The acid–base titration method was applied to determine the total acid number, using KOH as the titrant. The test was performed according to the ASTM D664 method at the university chemistry laboratory. The solvent for KOH was isopropyl alcohol, and the total acid number (TAN) is expressed in mg of KOH per kg of sample. The test was performed before and after conducting the experiment, at sliding speed of 200 rpm and load of 50 N, as the maximum friction and wear were observed for these operating parameters. Figure 6 shows the TAN obtained for different concentrations of nanoparticles in comparison with bare polanga oil. The maximum changes in total acid number were obtained for the alumina nanoparticle concentration of 0.1% and the minimum at 0.075%, with reference to the bare polanga oil. The difference between the bare polanga oil and that with 0.075% nanoparticle concentration is around 0.14 mg of KOH/g. Accumulation of nanoparticles on the surface results in the increase in the difference of the total acid number. 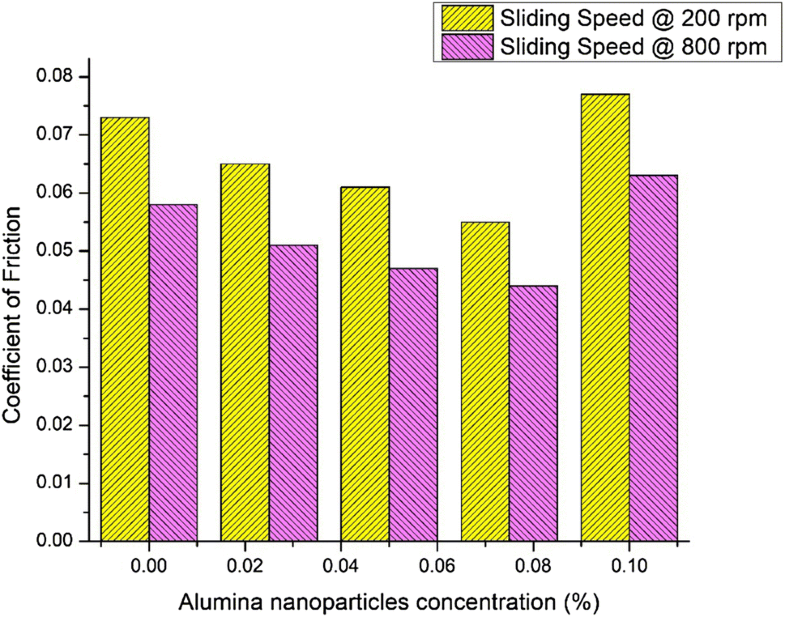 Figure 7 shows the diameter of the wear scar observed when adding the different concentrations of alumina nanoparticles. All the dimensions are in µm. The images show the pin after performing the experiment at sliding speed of 200 rpm and load of 50 N. The wear scar was measured in six directions, and the average value stated as the result. The maximum wear scar diameter was observed at 0.075% and the maximum at 0.1%. These results are in agreement with those in Fig. 4. The wear scar image of the pin after lubrication using the oil with higher nanoparticle concentration showed more furrows and wear debris, confirming the greater wear. 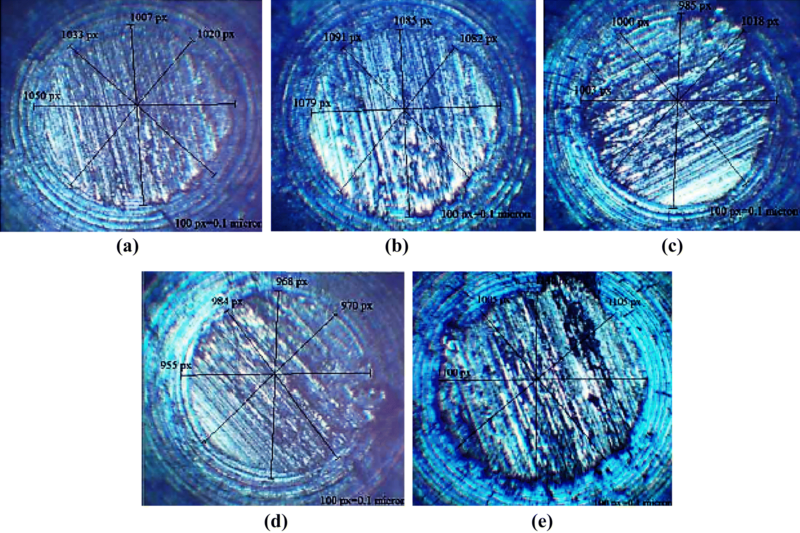 Table 3 presents the friction wear results obtained at sliding speed of 200 rpm and load of 50 N.
Figure 8 shows optical microscopy images obtained of the surface (a) before testing, and after testing with (b) bare polanga oil, (c) polanga oil with 0.075% nanoparticle concentration, and (d) polanga oil with 0.1% nanoparticle concentration at 200 rpm with load of 50 N, clearly revealing that the surface was improved by addition of alumina nanoparticles to the polanga oil. The most holes and cracks can be seen on the surface of the pin lubricated using the oil with 0.1% alumina nanoparticle concentration, while the minimum wear on the surface was observed for the 0.075% concentration, in comparison with bare polanga oil. The spherical structure of the particles results in a ball-bearing effect that prevents sliding contact and results in the improved surface of the pin. Nanolubricants and raw lubricants were compared using a pin-on-disk tribotester, focusing on the influence of the concentration of alumina nanoparticles. The coefficient of friction and wear rate of the lubricated surfaces were evaluated at constant sliding speeds and loads. The results showed that addition of alumina nanoparticles to the lubricant enhanced its lubrication characteristics. The presence of nanoparticles between the friction surfaces reduced the contact between the pin and disc by acting as ball-bearing spacers. The greatest reduction in the COF and wear values was obtained at nanoparticle concentration of 0.075%, and the maximum at 0.1% concentration. The nanoparticles therefore resulted in enhanced performance, but only up to a certain concentration. The wear scar diameter was also better for the 0.075% alumina concentration with respect to the reference polanga oil. The surface topography observed by SEM revealed that the surface of the pin was better only up to an alumina nanoparticle concentration of 0.075%. For future prospects, similar work could be carried out to investigate the effect of different nanoparticles in other nonedible oils and compare them as antifriction and antiwear additives.